I bought my very first laptop during the summer of 2000. There are cell phones today that have better specs than that laptop, but back then, it was a top-of-the-line machine. Another way to say this: I paid way more than anyone should ever pay for a laptop with a 20GB hard drive. It was priced at about $1,500. But then came the upsell. 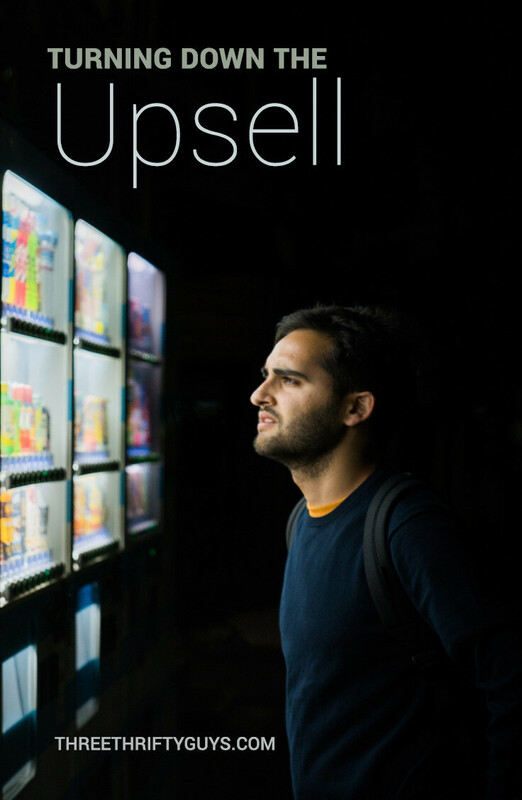 An “upsell” is when a salesman tries to convince a customer to buy something more expensive than what he or she intended to buy, or purchase accessories for the product as well. In this particular case, I did both. By the time I walked out of there, I had spent over $2,000. Unfortunately, that’s not the last time I’ve succumbed to an upsell. Even worse: sometimes, the upsell comes from me — a voice in my head convincing me that the better version is only $10 more, or a well-rehearsed sales pitch I recite to my wife as I lead her toward the bigger TVs at Best Buy. Eventually, I’ve come to accept that the upsell only seems like a great deal. In fact, sometimes buying more can end up being more hassle than it’s worth or simply money down the drain. Here are three examples where settling for less is not only financially savvy but practical, too. Technology today is powerful, fast, and cheap. That $2,000 laptop I bought 13 years ago is easily outclassed by current laptops selling for a quarter of that price. If your computer usage is limited to surfing the web, streaming audio and video, checking your email, and doing work in Microsoft Office, just about any of those inexpensive laptops or desktops will do. You can certainly improve your computer experience with a more powerful processor and a solid state hard drive, but you really don’t need either of those to do work in Word or watch cat videos on YouTube. If you have a hobby (like gaming or video editing), or are in school or a line of work that require specific programs, you may need a higher-end computer. Otherwise, a laptop with an mega quad core processor and a massive hard drive is probably overdoing it; you may never utilize all that extra power and space you pay for. My wife and I love the Harry Potter films, but we don’t own any of them. Years ago, we decided not to buy them individually and instead waited for the complete special collector’s edition blu-ray set that was inevitably coming. The set was released it last year…for $500. It probably would have been an almost complete waste of money had we bought it; I doubt we would have watched even half of the bonus footage and special features. Is the extra money for a special edition really worth a second blooper reel, or the making of the behind the scenes documentary? If you honestly can’t see yourself spending the time to watch all these things, sticking with the regular edition DVD should suffice. If you have a blu-ray player, don’t forget that it plays regular DVDs, too. I appreciate the high quality picture of blu-rays, but not every movie or TV show needs to be seen in 1080 HD. Buying a visual spectacle, full of special effects like The Avengers on blu-ray makes sense, but I probably don’t need to pay extra to own the latest season of The Big Bang Theory in full HD. A large HD TV might seem like a great buy, but consider the logistics of finding a place for one in your home. If it’s too big for your room, it can cramp your space and create poor viewing angles. It can also seem like you’re always sitting too close to the screen. In addition to larger sizes, salesmen will often try to convince you to buy a TV with a lot of fancy features. But as with special edition DVDs, ask yourself: are all those extra features worth the additional cost? Remember: buying a 3D TV means buying 3D accessories, a blu-ray player if you don’t already have one, and the more expensive 3D version of movies. If you have a Netflix or Hulu account, a TV with internet capabilities may make sense. However, it would likely be cheaper to get a Roku or similar HD streaming device instead. Also, most HD TVs have an input for computers, so you can stream movies from your laptop or desktop and use your TV as a monitor. Admittedly, I sometimes have trouble remembering all this while hearing a sales pitch in a showroom. But while a part of me will always want the faster computer and the bigger TV, I know that I’m so blessed that even when I settle for less, I usually still end up with way more than I need. Have you ever been upsold anything? How do you convince yourself to settle for less? One great way to save on electronics, even pretty new stuff is by buying used. I wanted a giant iPad Pro just to read the newspaper since it is no longer printed on paper in our town but no way I would spend over $1000 for the privilege. I looked around on eBay for awhile and when I saw a used one show up for $500 I jumped on it. Then I started to use the thing at board meetings and at the legislature and thought the Apple Pencil and keyboard case would really help. So I got the $100 pencil used for $50 and the $170 keyboard case for $50. Total price new would have been $1320 but I only paid $600 and have a top of the line rig. Everything works as good as new and nothing looks worn or old. I’ve done the same thing with premium tennis racquets and cell phones. You can get top of the line stuff for about half price if you can just hold off until somebody decides to ditch it for the next big thing. That’s good advice, Free Money. I used to really struggle with waiting for things (I once waited in line overnight to buy a Playstation 2!) but obviously, the money you can save makes patience and waiting worth it. Kyle — I don’t think Smart TV’s are terrible buys if you’re going to use all or most of its features. They can reduce clutter and simplify things in your living room. Of course, there’s a premium to pay for all that, but since you’ve already made the purchase, all you can do now is enjoy it. I hope you do! GetRich — It’s nice to have a partner who can say no! It makes saving money so much easier. I feel really dumb for just buying a Smart TV, I have a weakness for bright and shiny things. I clearly need help…. In technology, it can save you big bucks if you simply down sell (wait until a new version of the gadget is replaced and buy the last model). You will never really have the latest and greatest anyway, so you might as well just save a pile of cash and take the next best thing. Travis – I used to do the upsell all the time; I was basically doing the salesmen’s job for them. I used to buy a lot of collector edition video games but hardly ever intended to buy them until I saw them sitting on a store shelf. I enjoy having the bonus items decorate my living room (my wife is less enthused), but it’s mostly just a waste of space and money. Laurie – I am slowly gaining that willpower! But for now, I just try avoiding shopping altogether – I know I can still fall to the temptations! Financial Independence – I don’t know what’s more unbelievable: the markup on HDMI cables, or the fact that I’ve bought several of them from stores knowing that they’re overpriced. Delaying gratification is something I’m working on…but it’s been tough! Lyle – that’s a great deal :) I loved used stuff — especially when it’s free — but if I really want something, it’s hard for me to wait for a good deal. From what I’ve experienced in my social circle, I think most people can’t tell the difference between 720 and 1080, or even blu-ray and upscaled DVDs (I can usually tell the difference, though it sometimes depends on what I’m watching or playing). And so even if you believe that 1080P is better than 720…well, I agree with you: why bother paying for it if you can’t notice it? I never ever get the upsell. I always have in mind precisely what i want to buy, nothing more, nothing less! My computers – I have three – were given to me from friends who were upgrading there own and I have benefited greatly from their donations…including a 12 year old Dell Inspiron laptop that I use to surf the web and write with. As you might guess, I love used stuff and if something is good enough, then that’s good enough for me! What you’ve described is a marketer’s dream come true – get your customers to buy stuff they don’t really need. My partner often subscribes to the idea of buying the most modern or high-tech gadget because it delivers better resale value. I personally feel it’s better to stick to your budget and carefully choose the device that fills your basic needs. I too waited for the Harry Potter box set – on DVD though. Still it had a hefty price tag! It’s definitely easy to get carried away in terms of a better spec when looking for gadgets. I try to limit my spending completely (at the moment due to paying debts off). I have to really need something to part with my cash these days! I have a habit of impulse purchasing add-ons that I do need, but could get cheaper if I was willing to wait. Bought a new Blu-ray player? That needs a new HDMI cable. Sure they are under half the price online, but then I’d need to wait for one to get delivered. Great post, Ruser! We used to be terrible at falling for the upsell, now we’ve become the miserly folks who hold tightly onto their pennies when purchasing something new. We go to the store with a set in our minds vision of what we want, and shoot down an attempts to upsell with an iron fist! The worst is when you actually upsell YOURSELF! My wife and I were looking to buy a Blue ray player last Christmas. We were looking a several models – being a techie kind of guy I convinced myself, and my wife, that we needed all the bells and whistles to connect to the home network and have all kinds of streaming options. 9 months later, all we’ve done is rent blue rays and throw them in the machine to watch them. Boo on me!